If you get a new laptop running Windows 7/8/10, it makes sense to share that printer so that any computer can print to it. Unfortunately, trying to print to a shared printer on XP from Windows 7/8/10 is not as simple as it should be! In this article I will walk you through the steps for XP to Windows 7/8/10 printer sharing. I am assuming your printer is directly attached to a Windows XP machine and you want to print from a Windows 7/8/10 machine. Step 1: First make sure that the printer on the XP machine is shared. You can do this by right-clicking on the printer and choosing Sharing. Click the Share this printer radio button and give your printer a share name. Make sure is less than 8 characters and does not contain any symbols. 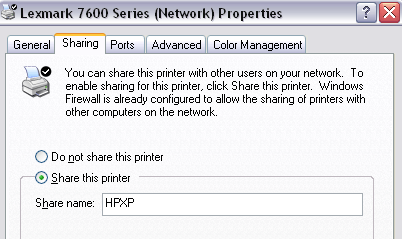 Step 2: Make sure you can see the printer share from the network browsing area in Windows 7/8/10. You can do this by going to Control Panel and clicking on Network and Internet. Then click on View network computers and devices under Network and Sharing Center. At this point, you should see the name of your XP computer in the list of computers. 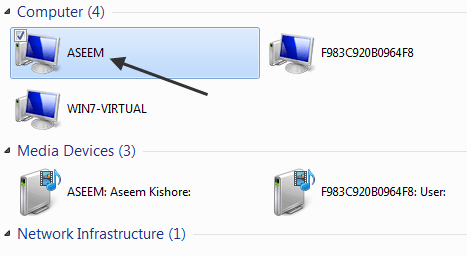 My XP machine is called Aseem. Double-click on the computer name and you should see your shared printer in the list. Here you can try to add the printer by right-clicking on it and choosing Connect. If everything goes perfectly, Windows 7/8/10 should automatically add the printer to your set of printers. However, if you get a message like “Cannot connect to printer”, follow the next steps. Step 3: Click on Start and then click on Devices and Printers. At the top, click on the Add a printer link. Step 4: Next choose Add a local printer. Yes, that sounds counter-intuitive, but this is what you have to do! Step 5: Next, click Create a new port and choose Local port from the list of options. 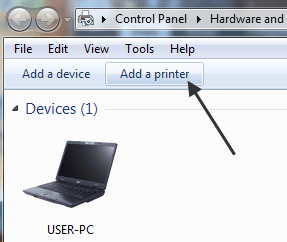 Step 6: Click Next and in the Port name box, type in the path to the shared printer. It should be something like \\Aseem\HPXP, where Aseem is the name of your XP machine and HPXP is the shared name of the printer. 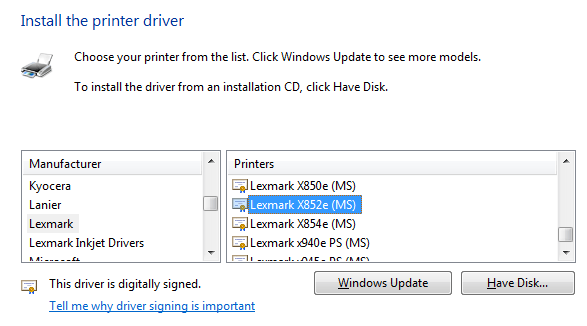 Step 7: Now choose the printer driver from the list or download the latest driver for the printer and choose Have Disk. Note that if you printer is a little older, it’s a good idea to download the Windows 7/8/10 driver for the printer and before clicking Have Disk. That’s it! Windows 7/8/10 will load the driver and you’ll be able to print to the XP machine from Windows 7/8/10! The main things to remember are sharing the XP printer and downloading the latest driver for the printer on the Windows 7/8/10 machine. If you have any problems sharing your printer on XP and printing from Windows 7/8/10, post a comment here and I will try to help! Enjoy! This also works for sharing a printer on a Win7 computer with an XP computer. I followed the instructions on the XP machine and I was able to connect. I did have to install the printer on XP first, connecting to a bogus port. Worked 1st time. Many Thanks. I have been trying to share a printer on my home network for weeks. It even works on a wireless connection via Router Access Point! My HP printer is connected to a W7 Desktop. Now, I have wireless access to the Printer from the XP laptop. 1. Make sure the computers are linked on a network. 2. On the Host Computer, follow the Sharing steps. 3. From the Client Computer, use the steps detailed above to connect to the printer. "Spooler SubSystem App has encountered a problem and needs to close"
The only way to clear it is to restart my XP PC (printer won't work from the PC until it's cleared). This was extremely helpful. Except, I was unable to "see" the computer on the network. What I did, instead, was add the check mark (in the printer settings) to "List printer in directory" on the host machine. So, while I was still unable to see the computer itself on the network, the process of adding the printer could find it because it was "listed in the directory." Thanks for the wonderful help! I wouldn't have thought of the other possibility without this initial problem solving. My new laptop was unable to connect to the printer on my XP desktop although I could see the printer I wanted to connect to. It just kept saying can’t connect. Your instructions worked perfectly on my windows 7 x64 laptop – XP desktop. Thank you so much for your help. When I did this with a windows 7 x32 laptop it connected easily without any of the above problems. Something to do with the x64 platform? I placed a comment yesterday concerning step 6 and a message I received concerning "Not enough server storage." I did some research on that and found some info concerning a registry key that might need to be modified. When I checked my reg I found the key missing. I backed up the reg and then edited it to include this key – IRPStackSize DWORD 0x0000000f (15) which is supposed to be the default size. Their suggestion was to increase the parameter. I just made the the key as is and all has worked fine. I printed a test page fine. Thanks again for your help. You have a very interesting blog that I now plan to follow. 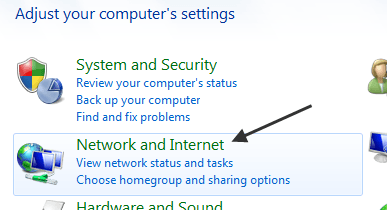 If you can't see your XP computer listed under the Network Tab, change the setting on the Windows 7 computer from "Allow Windows to manage homegroup connections (recommended)" to "Use user accounts and passwords to connect to other computers". This should let your Windows 7 computer see all the computers on your home network regardless of the operating system. Your tip worked superbly for connecting a printer from a Windows XP machine to a Windows 7 machine (32-bit), but it still doesn't work for connecting to Windows 7 (64-bit). It keeps saying that it can't install the driver with an 0x08000FFFF error (even after cleaning register, etc., etc.). 1. If the the Win 7 client machine is 64-bit, you will need a 64-bit driver for the printer. (If anyone has found a way around this I'd love to know!!!). 2. For some strange reason, I must allow file and printer sharing on my Win 7 client before it will "see" the share files and printers on the XP server. Thank you so much. I've had my old laser printer connected to my Windows XP Pro machine and haven't been able to connect my 64-bit Windows 7 laptop to it over about a year and a half! This worked great. I have a driver installed on the XP machine and another one on the Windows 7 machine that I verified was working by connecting directly to the printer. Once it was no longer physically connected, all I had to do was the local port trick. I have the same problem as Tom Miller above. I have a Epson Stylus Photo RX500 printer connected to a XP computer via USB. I'm trying to remotely print to it from my new HP Win 7 laptop and it fails. I get the message "NO driver found. The file *.inf on (unknown) is needed". I tried hooking the printer up locally to the Win 7 laptop and it works fine. It's pulling drivers from c:Windowssystem32spooldriversx64*.*. The problem is that none of these drivers are ".inf" like it wants when its trying to connect remotely. So I'm stuck. Please advise. Correction. The "add a printer" to local port instructions in this article worked. My mistake was that the first time through it did not finish up correctly so when I tried to add it again the computer said that the port already exists. What I did was change the shared drive name on the XP computer the printer is attached too. On the windows 7 wireless computer I went back and followed these instructions and, whola, the printer is now connected properly. The one thing I would add to this article is that after the "add a printer" is finished go to "control panel", then "devices and printers" and if the remote printer is not shown then the "add a printer" didn't work correctly. Had similar problem. The Win7 machine could see and ping the XP machine that had the printer connected directly to it, but the Win7 machine could never find/install the printer. I used the alternate method shown in the article, but when I used the text address to the printer (\\xpmachinename\SamsungC), I got an error message like “Network path not found.” So, I tried using the XP machine’s IP address followed by the text printer shared-name: \\192.168.1.103\SamsungC. This worked. Win7 even offered the latest driver, and the test page printed fine. I called Okidata tech support and they told me it couldn't be done, XP 32bit share, Windows 7 64bit client. Your instructions (steps 3-7) just proved them wrong. The built-in Windows 7 drivers for ML420's works fine if you connect them directly, but connecting to an XP shared one, all I could get was a long Windows Update search, followed by a prompt to find an missing INF file. Your method gets you to the driver list, just what I needed. I had the same problems reported by nitishgarg (April 4, 2011) and Bryan (Jan 11, 2012). 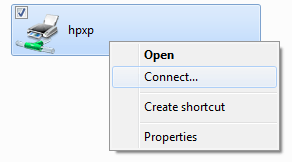 I could see the printer connected to the XP computer from my Windows 7 computer but when selecting it for connection it could not find the driver and would simply ask for the location of “.inf” file without much choice other than to cancel. I had connected the printer to the Win 7 PC directly via USB cable and it found the driver and was able to print fine. But when I tried to connect via the network it would run into the above problem. I followed the advice of adding a local printer and it pulled up the choice of printers and drivers, when I selected mine (Lexmark 232) it of course indicated there was already a driver for that printer (from the direct cable connection). Declined to replace it (it would not matter anyway, for it would replace it with the same version of the driver) and it was then able to connect just fine. Printer working thru the network now. I had loads of problems, including XP not showing on the Windows7 ‘View network computers & devices’ list. Eventually after I sorted that, when I tried to connect, a login screen popped and it wouldn’t accept any of the Admin account logins. Again, eventually sorted the problem out, but then found that my old printer didn’t appear on the list and HP don’t offer Windows 7 drivers for old printers! Well, luckily, I clicked on that ‘Windows Update’ button in your last picture. It took a good 5 minutes, I thought it had locked up, not responding, but eventually it did come back and the list of printers was quite a bit longer, and believe it or not, they even had my 10yr – old HP Deskjet, which not even HP could help with. Well done Microsoft. Loaded that driver and bingo, it printed the test page at first try. I was amazed, really pleased.. So thanks once again, Aseem, for this very useful Blog post, which although couldn’t sort out all my problems, it gave me a very clear framework of what had to be achieved. As I sorted out one problem, then I could progress to the next stage. Hi there, great writeup, thank you. However, I’m still having a problem connecting to an HP Laserjet 1320 that’s available via a Win XP client. I see the computer when I activate the Network icon, but when I double click on it, I get the message “Windows cannot access \\”, and running the Troubleshooting utility doesn’t rectify things either. What’s interesting is that I am able to connect to another XP client which also has a 1320 printer attached, and it works fine, so I’m thinking there’s something with the original XP client that needs tweaking. Any ideas? If after step 6 in this article (above) you get a message that says the port already exists, then open devices and printers in the start menu, right click on that printer, and select remove. If the printer associated with the port is no longer present in devices and printers, then open printmanagement.msc. (You can find it quickly by typing it in the search box in the start menu.) Look around in there and you should be able to find and delete it. I followed all your instructions step-by-step and still cannot print from my hp laptop Windows 7 to my printer on Windows XP. The printer is HP PHOTOSMART 7760. When I try to connect to the printer from windows 7 I get an error message: NO driver found . The only driver I have is for Windows xp and my windows 7 can’t find any upgrade. Help me please. Aseem, the instructions given were right on! I used it to work on Windows 10 and XP Pro. I was able to get 2 printers on two different XP computers without any issues to work on Windows 10. This allowed me to get the new drivers in W10 at the same time. A job well done!